Silversea Cruises continues to sail against the trends with intimate ships that offer not only a richly abundant and highly personalised onboard experience, but also a meaningful and life-enriching travel experience for their guests. As the inaugural ship for Silversea Cruises, Silver Cloud epitomises everything that is Silversea. Designed to provide the most intimate of sailing experiences, a Silver Cloud cruise provides 296 privileged guests with the luxury of space and the ability to slip into exotic ports off the beaten path. Our shining luxury cruise ship is often described by returning guests as their own private yacht, their home away from home. 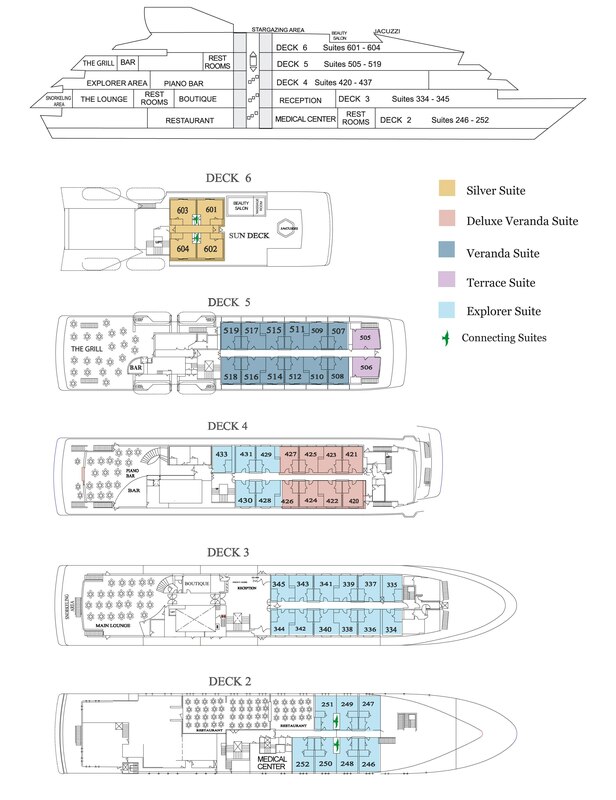 After extensive refurbishment, Silver Cloud is the most spacious and comfortable ice class vessel in expedition cruising. Her large suites, her destination itineraries and her unparalleled service make her truly special. Her five dining options will tantalise your taste buds and as 80 percent of her suites include a veranda, watching a breaching whale or a few cavorting penguins has never been so personal. Broad sweeping decks with multiple open spaces and a swimming pool complete what is surely the most distinctive expedition ship sailing today. A limited number of guests in polar waters, mean that Silver Cloud has the highest space to guest and crew to guest ratios in expedition cruising. With her 16 zodiacs, 10 kayaks, possibilities are almost limitless with ship-wide simultaneous explorations. Finally, a team of up to 22 passionate and dedicated expedition experts are always at hand to ensure your voyage is enhanced every step of the way. Silversea’s Millennium Class ships – Silver Shadow and her sister ship Silver Whisper – are built with proportions slightly larger in size than the two earlier ships, yet retain the same level of genuine hospitality. Third in the Silversea fleet, the Silver Shadow luxury cruise ship introduced guests to the next generation of Silversea cruising while maintaining Silversea’s award-winning, all-suite luxury and trademark intimate ambience. Taking Silversea’s award-winning concept of all-suite luxury to the next level, these two sister ships – Silver Shadow andSilver Whisper – are slightly larger, yet retain the familiarity and intimacy of Silversea’s two earlier ships. Aboard the Silver Whisper cruise ship, savour a convivial cosmopolitan ambience and many special amenities usually found only on larger ships, including boutique shopping; a wellness spa with beauty salon, fitness centre and sauna; full-scale productions in a multi-tiered show lounge; an Internet Café and WiFi service from stem to stern. Embark on a luxurious expedition to the best far-flung destinations in the world aboard Silver Explorer, a purpose-built expedition ship unlike any other. Designed specifically for navigating waters in some of the world’s most remote destinations, including both of earth’s polar regions, the 6,072-ton vessel boasts a strengthened hull with a Lloyd’s Register ice-class notation (1A) for passenger ships. With eight Zodiac boats, her 132 privileged guests can visit even the most off-the-beaten path locations. Experience the thrill of a true expedition aboard Silver Explorer. Venture deep into regions where other vessels cannot go whilst enjoying a privileged lifestyle that is simply second-to-none. Onboard, savour a convivial cosmopolitan ambience and many special amenities usually found only on larger ships, including a spacious Library with an Internet Café, boutique shopping, a full-service spa, beauty salon, fitness centre, sauna, live evening entertainment and two top-deck whirlpools. The Silver Explorer even features The Humidor, where connoisseurs can enjoy the finest cigars and cognacs — a diversion offered by no other expedition ship. Meet the newest addition to Silversea’s fleet of ultra-luxury ships: the 100-guest Silver Galapagos. With sleek lines and a proven skill for navigating the waterways throughout the Galápagos Islands, she is naturally suited for in-depth explorations of this spectacular region. She offers all the intimate conviviality and elegant sophistication that has made Silversea the preferred choice for today’s discerning travellers.